In looking to automate the VSAN Stretched Cluster configuration, I was interested in something that would pretty much work out of the box and not require any additional download or setup. The obvious answer would be to use the Ruby vSphere Console (RVC) is a really awesome tool that is available as part of vCenter Server included in both Windows vCenter Server and the VCSA. For those of you who have not used RVC before, I highly recommend you give it a try and you can take a look at this article to see some of the cool features and benefits. I am making use of the RVC script option which I have written about in the past here to perform the VSAN Stretched Configuration. 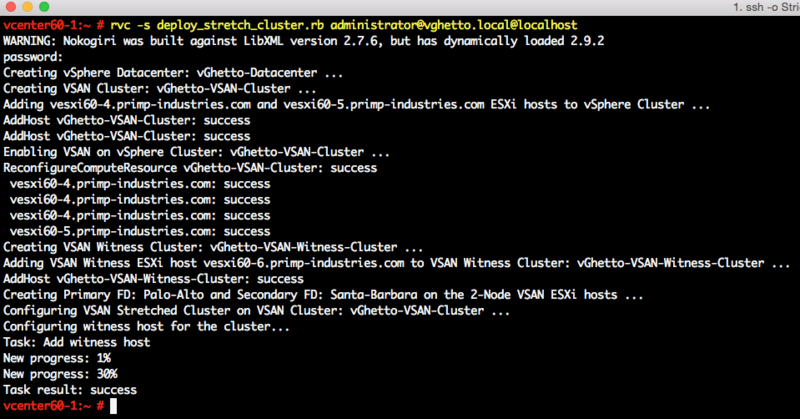 One of the new RVC namespaces that have been introduced in vSphere 6.0 Update 1 is the vsan.stretchedcluster. * commands and the one we are specifically interested in is the vsan.stretchedcluster.config_witness command. There are a couple of things the script expects from an environment setup, so I will just spend a few minutes covering the pre-reqs and the assumptions before diving into the script. I will assume you already have a vCenter Server deployed and configured with an empty inventory. I also assume you have already deployed at least two ESXi hosts and a VSAN Witness VM that meets all the VSAN pre-reqs like at least one VSAN enabled VMkernel interface and associated disk requirements. Below is a screenshot of the vSphere Web Client of the initial environment. If everything executed successfully, you should see a "Task result: success" which signifies that the VSAN Witness VM was successfully added to the VSAN Stretched Cluster. 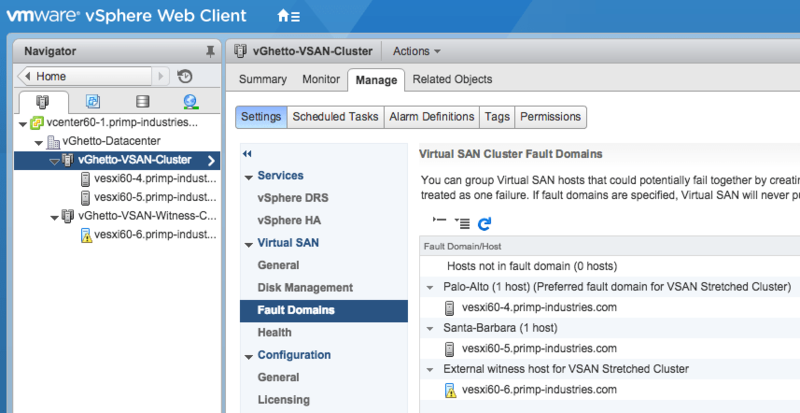 If we now refresh the vSphere Web Client and under the Fault Domains configurations in the VSAN Cluster, we now see both our 2-Node VSAN Cluster and the VSAN Witness VM. Hopefully this script can also benefit others who are interested in quickly standing up a VSAN Stretched Cluster, especially for evaluation or testing purposes. Enjoy getting your VSAN on! How to convert vSAN RVC commands into PowerCLI and/or other vSphere SDKs? How to run the VSAN Observer in “collection” mode in the background? How to upgrade to the latest VSAN Beta Refresh of RVC on Windows?